If you are on the market to buy a property in the Sunny Isles Beach area, then Jade Ocean is something to be considered and is a very good choice. The luxury condominium, Jade Ocean, is one of the most desirable condominiums in this area and the units in this condo tower are very popular among the investors as well as end-users. So, if you want to purchase a unit in this condominium, you can examine the listings available for sale, rent as well sold history and statistics to learn more about this building as well as different investment strategies. You will find all the luxury amenities and facilities in this condominium and even much more than what you expect. The great tower is designed by the famous architect and designer, Carlos Ott. The structure of this condo tower is splendid and the exterior and interior designs are all glass and looks very modern from the outside. The appearance of this 51-storey, glass structure is highly impressive and it is a dream residence to every condo buyer. 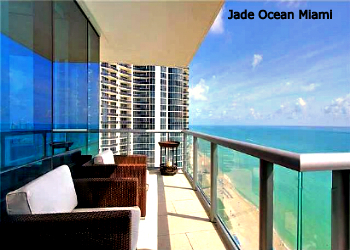 Jade Ocean, Miami, offers 256 beautiful and spacious units for sale. All the units have elegant furnishings and the interior décor is stunning. There is a magnificent six-storey waterfall at the entrance of the building. In addition, the location of this condo is in the heart of Sunny Isles Beach, directly across all major shopping plazas. Being situated directly on the Atlantic ocean, this condo offers private beach and a restaurant to it’s residents. Being located in Sunny Isles Beach, it offers major attractions of the city, the famous shopping areas, being close to the international airports, business centers, night clubs, etc. You may learn more about units at Jade Ocean for sale. If you are interested in buying a unit, you can contact Lana Bell of One Sotheby’s International Realty Sunny Isles Beach branch at (305) 336-0457 or visit our website below. When people buy units in a luxury condominium, they expect to get various luxury amenities and services, which can make their life more beautiful and blissful. In Jade Ocean, you will find several top-class features, residential facilities, and services that will certainly fulfill all your expectations. The building features a stunning three-storey lobby at the entrance. For the residents to enjoy and relax there is a private beach club with cafes and cabanas. The infinity-edge pools are beautiful and splendidly designed. There is the availability of covered parking areas for the cars, with round the clock valets on duty. The residents feel secured with the presence of full-time security. The residents can stay in shape with the help of well-equipped fitness centers. In every unit, there is a wireless, touch-screen monitor with the help of which, the residents can access different services, such as valet, concierge, room services, etc. There are large terraces that offer amazing views of the surrounding areas. The floor-to-ceiling windows enhance the appearance of the units. The kitchens are spacious and offer granite countertops, European cabinetry, glass cabinets, Miele and Sub-Zero kitchen appliances, etc. The bathrooms have whirlpool bathtubs, European faucets and fixtures, marble floors, etc. There is the availability of one, two, three and four-bedroom units in this lavish condominium for sale. The units are highly desirable and by residing in this luxury condominium, you will get to enjoy the opulent lifestyle that everyone desires.